It's approaching fast. I've created a sign up using google forms. CLICK HERE TO SIGN UP . We are compiling a list of boats that will be in attendance. Of course it's not required that you bring a boat but we're always asked what boats will be there. This list will generate automatically. You can see what boats have already registered here. As in years past, we will be having a Friday banquet buffet style dinner at little Italy's restaurant. We will pre-order the buffet so we need anyone who would like to join us to purchase their meal "tickets" in advance as we will order food for that many. There are links to puchase tickets (1 per person, kids 12 and under don't need) or CLICK HERE. 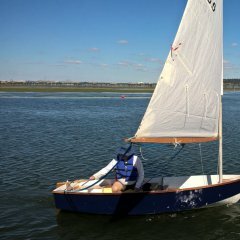 In years past we have tried to do some sailing/boat building/cnc demos. Any good ideas, shoot them our way. Looking forward to seeing everyone there; I'll be tent camping Fri/Sat (my wife and three kids will coming for Saturdays lunch; we live fairly close by). Could you tell us what accommodations are available in the area ? Thanks, I plan to be there Friday afternoon with my Spindrift. Summer Breeze said she'd be there if she hasn't been adopted yet. Probably the motor canoe, too. we should get there late Friday. If the weather is good, we'll probably stay an extra day or two and have a mini-cruise. We will join you Chick, we "plan" to make it out to Portsmouth this year. Understand the mosquitos are hungry! Question for all of you that have gone before. Unfortunately driving this year is out of the question. So......I'm thinking of flying to 1. _________ and then renting a car to come to the Messabout. I could camp (is this a good idea?) or stay somewhere close like _____________? I'm thinking of flying down Friday morning and staying until Sunday. All of this is tentative. I'm going to MASCF and and then my companies office is moving over the weekend of the 10/15. So I have to make a lightning quick strike down. I am really back at the boat hard. I glued the seats down and that feels like a major psychological turning point. So I want to recon the rigging fine points on the CS II's there and meet all you guys. I just wish I could bring my S11N but its not in the cards. There are commercial flights into New Bern. The campground around the corner has "trailers for rent", like the old song. Or you can camp at the shop with your own gear, as I am doing. At the shop there'll be a porta-john and a water hose, but no flush toilet or shower. If you like, you can borrow my solar shower. Bayboro has a wonderful seafood restaurant, so I eat there often. There's a good breakfast diner there, too. Bayboro is about 10-15 minutes down the road. I look forward to seeing you. I just booked my flight. I should be there mid afternoon Friday. I had enough points on Southwest so I'm flying into Raleigh/Durham and driving down. I hate that I won't have my own boat, but next year I may have two! Any musicians at this event? Chick said he is planning a mini cruise after the Messabout. You said you were planning a cruise prior to the Messabout. Will you be staying after the Messabout as well? Sally and I are trying to plan for a two to three day cruise either before or after, depending on how we can work out our schedules. So far Summer Breeze plans to get there Friday afternoon sometime. She says she'd like to take off sometime Sunday afternoon for a mini cruise. It will either be up into the Pamlico River toward little Washington, down to the Neuse and toward New Bern. Then again, It could be across the sound to Portsmouth Island. You know how ladies are. She just won't make up her mind until the last minute. I think that it has a lot to do with how tired she gets. If she would ask for my opinion, I'd see what conditions and forecast were to make my decision. Also depends on some issues back home. I jes dunno. Friday and Saturday night we'll be shacking up across the crick from the B&B dock. We've got a good 'ol book and collection of "big band" cassettes to listen to. And crackers and Vienna sausage to munch on. Summer likes to nibble on the crumbs I drop in her bilge. (Shhh, don't tell her I said that, she'd be embarrassed.) She doesn't much like the Old Fogey music, but, too bad! She knows better than to complain. HEY DON, do the Vienna sausages really come from Vienna? Anyway, we're both looking forward to seeing our friends. BUT WAIT--- what if the Breeze has a new home by then? Come on Chick,,,, Vienna sausages where made to test the flushing action of marine heads and can be used for emergency fish bait! Also make great puppy treats but if you read the small print they were never intended for human consumption. In my working career, we ordered cases of Vienna sausages..... and used them for bait to catch amberjack! A worthy conversion! I think we need to start a boat food thread! To call VS a food is a long stretch , as Crocodile Dundee said it will keep you alive but tastes like @$%#. Chic you are not alone in this, think of the millions that stop at McDonalds and think that is food. Chicken nuggets are made in a similar way as VS. Its pressed stuff blown up with oil, fat and other stuff to make you think you are eating something of value. My brother thinks VS are related to fine steak, he's a full time live aboard boat person. But then again he thinks instant coffee is heaven sent also. Spam is at least made from pork shoulders and not parts of all the critters on the Arc. I don't care for it but my mental state has been questioned before. Cooking is the thing I look forward to when I drop the hook. Get a BBQ grill and enjoy the adventure of cooking, good book, music and the sunsets. Heavens-to-succotash, the Breeze and I sure didn't know what we were starting with the VS thing!!! Actually, I reserve them for lunch time when I'm sailing. I go all out in the cooking department at supper time. A whole can of Beefaroni! Now, that's livin' high! "Adventure of cooking"? HA! Me cook? Hey, I even burn water. Well, maybe it's not all that bad. i can usually heat up some good-ol hot dogs without burning them. That's gourmet cooking for me. Put a pot on the burner, light the fire, pop the dogs in, wait 'til the water just starts to bubble, DONE. Enjoy. Oh yeah, don't forget to turn off the burner. Whew, now I'm all worn out from all that slaving over the stove. Now let's get back to messin' about on the crick.